Besides the CDX HY vs CDX IG widening caused by the JPMorgan CIO's outsize trades, there is also a dislocation occurring between the CDX IG Series 9 (S9) and Series 18 (S18). JPMorgan's S9 trades have been well publicized recently but it remains unclear how big of a position (short protection) the bank still holds. 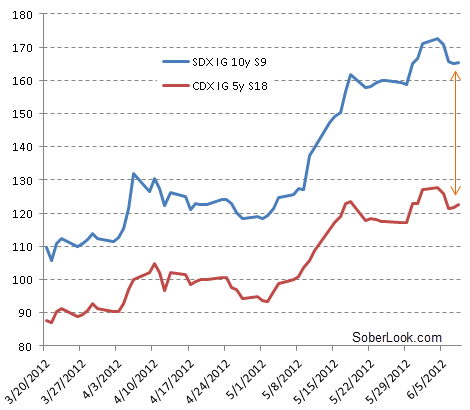 The 10-year S9 matures on 12/17 while the on-the-run (latest IG CDX) 5-year S18 matures on 6/17 (just 6 months apart). Therefore it is more constructive to compare the S9 10-year with S18 5-year rather than with S18 10-year. The spread between the two has been widening consistently, reaching a high of 45bp a couple of days ago. This looks like an opportunity for a trade as over time the spread between the two should narrow again. However since the widening is likely driven by JPMorgan, there may be room for further widening if the CIO's office is indeed unwinding their massive position. And this widening is sure to cause JPMorgan to incur additional losses.